The Breakers Palm Beach has been recognized by the prestigious World Travel Awards as one of North America’s Leading Golf Resorts for three consecutive years. This world-class resort proudly features two championship golf courses, the Ocean Course and The Breakers Rees Jones Course. The resort is also home to the acclaimed John Webster Golf Academy, as well as the 32,000 square-foot The Breakers Ocean Clubhouse. How do these distinctions make The Breakers an award-winning golf destination? The historic Ocean Course offers a true vintage golf experience. 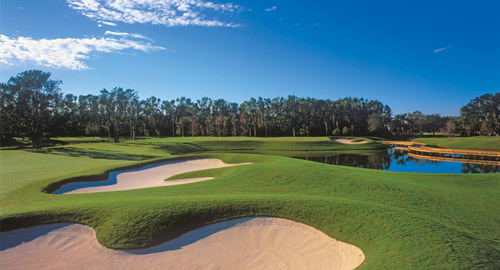 Originally laid out by Alexander H. Findlay in 1896, and completely redesigned by famed golf course architect Brian Silva in 2000, the championship course embodies an old-world sensibility through elements such as random bunkering throughout the landscape and fairways that weave between sandy hazards. Surrounded by beautifully landscaped greens and overlooking the Atlantic Ocean, the Ocean Course is located on-site at The Breakers. A more contemporary championship course reconstructed in 2004, The Breakers Rees Jones Course offers a more playable game that entices players of all skill levels. Located 11 miles west of the main resort at the upscale Breakers West, golfers enjoy lush foliage and numerous water hazards resembling a nature preserve, all encompassed by an immaculately landscaped residential community. At the John Webster Golf Academy, players benefit from year-round golf instruction, state-of-the-art Learning Centers at both courses, and a team of highly-skilled teaching professionals available for private lessons, golf school formats and specialized instruction for kids and teens. The Academy also offers personalized fitness evaluations and custom club fitting. Webster is a Titleist Certified Fitness Professional and one of only four Prominent Titleist Club Fitters in the world. The Breakers Ocean Clubhouse is a casually elegant retreat for golf and tennis players. A highlight is The Sports Pro Shop, which offers golf and tennis equipment and designer merchandise, and was named one of the Top 100 Best Golf Shops by Golf World magazine. The Clubhouse also features luxurious locker rooms, a fitness center with state-of-the-art equipment, sauna and steam. On the second floor is The Flagler Steakhouse with prime-cut aged steaks and spectacular views of the fairways. With so many sensational golf amenities, it’s no wonder why The Breakers Palm Beach has been named one of North America’s Leading Golf Resorts for three years in a row. MDG Advertising handles advertising, collateral design and integrated marketing for The Breakers Hotel, Spa, Ocean Club, Breakers West, the Phillips Point Club, its 4 restaurants and 11 retail boutiques. MDG Advertising, a full-service Florida advertising agency, with offices in Boca Raton and New York, NY, specializes in developing targeted, digital marketing solutions, exceptional creative advertising executions and solid branding and media buying strategies that give clients a competitive advantage. To view MDG’s hotel/hospitality projects click here.